in providing superior quality Below the Hook Lifting Equipment. A family owned company started in 1972 , we operate out of our Central NJ location in Hillsborough, NJ. Servicing all of the country including Mexico, we continue to expand our services around the world. From the beginning and continuing that tradition, Permadur focuses on understanding the intent of the application to properly design a below the hook system. Safety, Productivity, and EFFICIENCY is the baseline for all of these designs. For over 40 years Permadur Industries has been recognized as a industry leader in providing superior quality Below the Hook Lifting Devices. A family owned company started in 1972 , we operate out of our Central NJ location in Hillsborough, NJ. Servicing all of country including Mexico, we continue to expand our services around the world. Permadur Electrically Controlled Permanent Magnets will not drop a suspended load due to power failure, faulty wiring, or misoperation of controls. No back up battery system is required and no power is consumed during the lift. 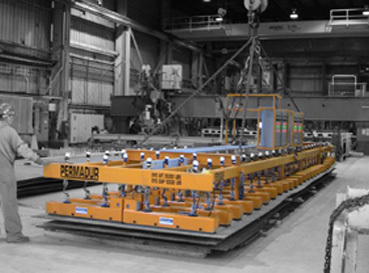 Utilizing the performance and safety features of the Permadur Lifting Magnets, these plate handling systems can handle single plate off of a stack and be operated remotely by the crane operator. These systems increase the productivity of your cutting operations by dramatically reducing the material handling time which results in increased Torch “ON” Time. Permadur Vacuum Lifting Systems provide a lighter, more economical way of addressing a wide range of Aluminum, SS, and Carbon Steel Plate Handling Applications. Permadur’s BPM and REM series manual lifting magnets are utilized where there is demand for lifting heavy steel pieces EFFICIENTLY. Machine shops, cutting/saw workstations, and steel service centers will use varying capacities of manual magnets. Permadur’s Load positioner is a below the hook lifting and lowering device that is hydraulically operated. It simplifies alignment and assembly as well as reduces the risk of part damage. Routine Maintenance, reconditioning, and repairs will extend the service life of your lifting magnet or vacuum system. When scheduling your downtime, let Permadur’s skilled Technicians inspect your equipment and recommend the best preventive maintenance program. A Permadur Customer Service Representative will review the request and contact you shortly. Which Type of Lifting Magnet System is Right for the Job? c. 2016 Permadur Industries Inc. All Rights Reserved.